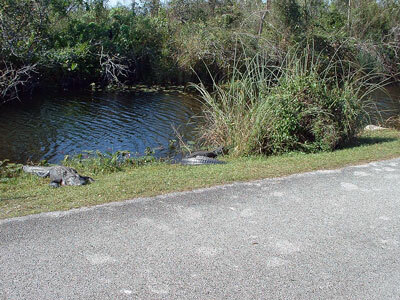 The nature experience at the Everglades is nothing like any other park you will go to. As close as the parking lot, you find the wildlife sunning itself and taking it easy. These two gators were no more than 10 feet away from me and Sam and that was after I was startled by turning a corner and nearly stepping on them. (I was walking on the far side of the tarmac shown here. There was a ranger nearby who chuckled at the startled tourists who, to a person, did what I did--stopped, did a double-take and walked to the far side of the road--as though that would be enough to protect us if a Gator took it in mind to have a two-legged lunch. This page contains a single entry by Steven Riddle published on January 14, 2007 3:27 PM. There's a Reason It's Called "Sawgrass" was the previous entry in this blog. A Face Only a Mother Could Love is the next entry in this blog.